What would happen if you ate every food advertised during the Super Bowl? Posted on Tue, Jan 31, 2012 : 2:38 p.m. Bud Light Super Bowl commercials clock in with a massive 30,000 calories per ad. Photo by Flickr user Dyanna. For many Americans, Super Bowl Sunday is more about the pork rinds than the pig skin. It's all about getting together with friends (and snacks) and watching the big-budget commercials. But what would happen if you snacked on all those foods featured in the commercials? Jon Eick examines the caloric content of Super Bowl commercials in How to Gain 60 Pounds While Watching the Super Bowl on PBS Food. Eick tracked all of the food and drinks visible on the screen and calculated how much weight you would gain if you ate and drank it all. 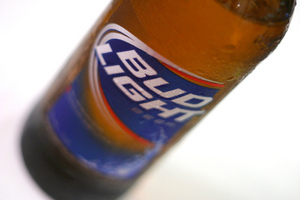 The most calorie-rich commercials by far came from Bud Light, with a combined total of nearly 90,000 calories over three ads. And according to Eick's calculations, if you had eaten every food and drink featured during recent Super Bowl ads, you would have gained 30 1/2 pounds in 2011, and a whopping 60 1/2 pounds in 2010. You can read the full article on the PBS Food site. The &quot;Stuper bowl&quot; is the largest big business con I've ever witnessed in my life. For a whole year we do all we can to avoid tv commercials. This one day people actually go out of their way to eat junk food/ get loaded/ watch commercials , and pretend to support a team that they could care less about. Wed, Feb 1, 2012 : 6:23 a.m. Wed, Feb 1, 2012 : 2 a.m. I had to think awhile to come up with any food in a Super Bowl commercial. So much attention is given to other commercials, with celebrities playing roles, that food takes a back seat. The Doritos one at last year's Super Bowl was funny; Adam refusing an apple Eve offered, satisfied with his bag of Doritos. If I ate everything advertised during the Super Bowl my new name would be Cornholio. Wed, Feb 1, 2012 : 1:01 a.m. I'm in it for the helmet to helmet hits. And wardrobe malfunctions during the awful halftime show. Wed, Feb 1, 2012 : 6:44 p.m.
Not sure how old you are Brando, but this 50-year old probably wouldn't want to see what you've got hanging either. Go Madonna! Tue, Jan 31, 2012 : 11:36 p.m.
&quot;Seeing plastic hanging off a 50-something year-old cannot be pretty.&quot; Joseph.... After that many surgeries, she *is* plastic. Tue, Jan 31, 2012 : 10:56 p.m. I am not sure if want to see Madonna's 'malfunction'. Seeing plastic hanging off a 50-something year-old cannot be pretty. Tue, Jan 31, 2012 : 9:39 p.m. This article would have been more effective if a few sentences were devoted to actually breaking down at least one commercial and the food shown. With out it, this seems like a powder-puff piece that is merely promoting a PBS article. C'mon AA.com....put some effort into this if you want my loyalty.